I read quite a few books. Many of them I enjoy and/or love, others not so much. Very rarely do I read a book that makes it hard to move on to the next book on my To Be Read list. After reading 45 books so far this year, only two have left me feeling that way. The first was John Green’s The Fault in Our Stars, which I read in January and you can read my review here. 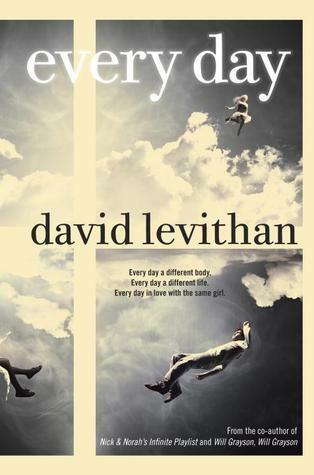 The other book is one that I had just finished reading, Every Day by David Levithan. I’ve always been a fan of David Levithan’s books. I love how genuine and real his characters feel. Every Day is basically Levithan flaunting what he’s immensely good at: characterization. In this book, the main character, A, wakes up in a different body every day. He never stays longer than a day and never woke up in the same body twice. A doesn’t know how or why he can do this; he just has always lived life like this. He’s responsible when it comes to taking care of each person’s body and doesn’t do anything drastic while he possesses the body. Of course, it’s a lonely existence for A. He has no real family or friends. How can he when he has to play a different person each day? However, one day, A wakes up in the body of boy named Justin and falls in love Justin’s girlfriend, Rhiannon. Breaking all his rules, he does something very out-of-character for both him and Justin and spends a wonderful and life-changing day with Rhiannon. Hence, A and Rhiannon seek to discover if love can survive all impossibilities and complexities. Because A wakes up in a different person each day, we get to meet so many different characters and personalities. Everyone has their own little story. Even though A is trying to figure out his own problems, he can’t help but become involved with that particular person’s life each day. This is what I meant when I said this is what David does best. Each person felt so real, like they actually exist. They were all normal people, but Levithan still manages to make each one memorable. It’s all these little precious stories that are part of A’s big story of finding, keeping and understanding love in all its forms. The bond he has with Rhiannon is strong, but A’s fate is so damning when it comes to having a relationship. It’s definitely a new kind of forbidden love. Without a doubt, this story is one of the most fascinating and heartrending books I have ever read. A’s voice is completely captivating, and from the very first pages, you want him to have everything because he deserves it all. I like how A views himself (or even herself). A doesn’t view himself as female or male; he wakes up in both genders’ bodies. (I’m referring to A has male in the review because he’s possessing a boy’s body when the novel begins. But I truly don’t associate any gender with A.) After experiencing many lives, he doesn’t feel compelled to judge them. By the time I got to the end, I found myself really admiring A. And that ending… was excellent. Just “wow.” Perfect. Every Day is David Levithan’s best book to date. It doesn’t come out until August, and I wasn’t meaning on writing this review so early, but I thought I’d get the early buzz rolling because you guys need to read this book. Take a moment to make time to read Every Day, and meet the wonderful A and go on this thought-provoking journey with him. You can pre-order Every Day by David Levithan at our TYF store, powered by Amazon. Series: Could possibly be a series… Not confirmed. Next ArticleFilm News: Phillip Seymour Hoffman Offered Role in CATCHING FIRE!